Three musical minds have come together on Dim Mak's latest release, ‘Bring You To Life (Transcend)’. This progressive house track fuses label owner Steve Aoki with Rune RK, one of the creative minds behind the track ‘Calabria’. Defined by its warm lead sounds, ‘Transcend’ was one of the most popular tracks on Steve Aoki's ‘It's The End Of The World As We Know It’ EP from last December. Now the track gets that extra edge with the passionate and sultry vocals of RAS. Originally appearing on the NEZZO & Summer School track ‘Shadows’, RAS has been eagerly anticipated to get back on the mic for another song. 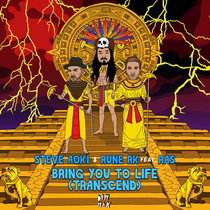 Riding on top of the production skills of Steve Aoki and Rune RK, RAS gives a firm example of his singing chops on ‘Bring You To Life’. The combination of RAS' delivery on the should see the track do well for the Dim Mak label. Check it out below, it’s out next week.